The Best CPE. Unlimited Access. One Low Price. 10,000+ credit hours of highly-practical content, in packages that match your needs AND your budget. Need a Course to Meet Your Ethics CPE Requirement? Check out our wide selection of live webinar and self-study options, including courses that meet both general and many state-specific requirements. CPE Deadline? Get All the Credits AND Expert Insights You Need with a Surgent CPE Package. With more courses than anyone, including Tax Updates, itâ€™s the best value in CPE. Learn More! Stay informed all year! Buy your 2019 Unlimited Webinar Package now! New Webinar! Prepare now for client questions on pending tax reform. Exclusive-to-Surgent all-star experts with more than 500 CPE Speaker of the Year Awards. Since our faculty has over 10,000 years of collective experience and owns more than 500 CPE Speaker of the Year Awards, itâ€™s no surprise CPAs rate our instructors a perfect 5 for knowledge a whopping 76% of the time! For pro insights from Discussion Leaders like Mike Tucker, Bob Lickwar, Charlie Blanton, Sue Smith, Dennis Benvie, and Rich Daisley, Surgent is your exclusive source. With 10,000+ credit hours in our catalog, we have more (and better) CPE choices than anyone. Our huge catalog features exciting new titles, including timely updates on all aspects of the Tax Cut and Jobs Act. We bring you the practical info you need - before any other provider. We keep our broad catalog fully up-to-date by thoroughly reviewing every course at least twice a year. And when critical changes happen that affect guidance, we're by far the first to update our courses. CPE Webinars That Are Worth Your Time & Fit Your Schedule. Events daily for all time zones. We know you're too busy for CPE that doesn't teach you anything. The busier you are, the more critical it is to pick CPE that's worth your time. Surgent always delivers top-notch CPE in ways that are ideal for busy CPAs. We offer live webinars on evenings, lunch breaks, even weekends-at times that work for all time zones-and 1,650+ hours of 24/7 on-demand CPEâ€”including PDFs and streaming webcasts. 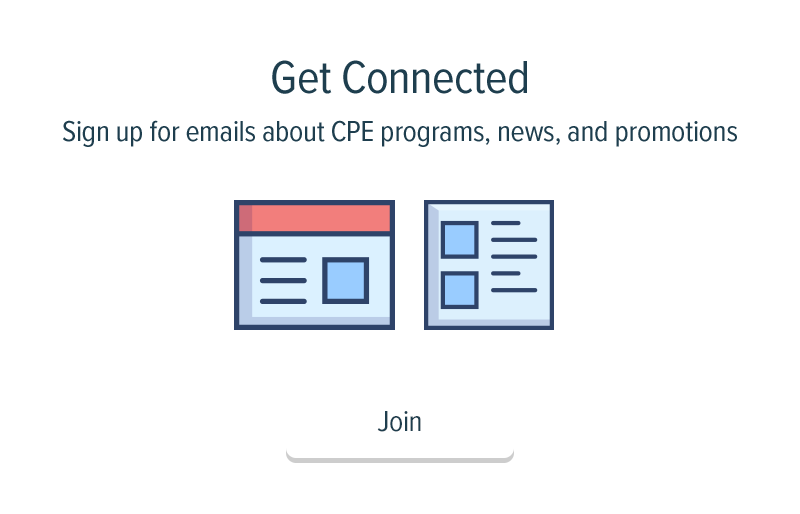 To save you a step, we email your CPE certificates instantly after you earn your CPE. Real Professional Education, Not Just CPE Credits. Our dedication to education goes well beyond credits. You spent a lot of time and money becoming a CPA. We'll help you nurture that investment by keeping your skills and knowledge sharp. From courses like our top-rated annual tax updates to our best-in-industry video experience, and our unmatched customer experience, Surgent CPE always has your back. That's why pros who know choose Surgent. More CPE Course Topics Than Anyone Else. Top CPAs Pick Surgent CPE Courses. Here's Why. Surgent (formerly Surgent McCoy) has been a leader for over 30 years in continuing professional education (CPE) for CPAs and other financial professionals. We provide thousands of online CPE webinars, self-study courses, CPE packages, and live seminars each year for accounting, tax, and financial professionals all across the country. In addition, we have a growing selection of online exam review courses that help candidates much more quickly earn their CPA, EA, CMA, or other credential or designation. We partner with nearly all state societies of CPAs, many of the nation's top accounting firms, and a growing number of colleges and universities. Surgent is registered with the National Association of State Boards of Accountancy (NASBA) and as a sponsor of CPE on the National Registry of CPE Sponsors and as a QAS Self-Study provider. Surgent is also an approved provider of continuing education by the IRS, the CFP® Board, and by CTEC. For more information on Surgent accreditations, visit https://www.surgentcpe.com/Accreditations or call us at 800-778-7436. As a successful CPA, Jack Surgent well understood the critical role that Continuing Professional Education plays in the accounting profession, which is why he founded Surgent in 1985. His commitment to delivering the most practical, relevant, and accurate information to practicing CPAs quickly drew loyal audiences to Surgent CPE seminars all across the country-and to Surgent's huge offering of online CPE programs in more recent years.